And now you’re looking for a photographer to take photos of you, your significant other and that gorgeooooous ring!? Look no further! We specialize in photographing couples being in love. We loooove couples! We love to photograph love. Photographs are one of the many tools that we can use to tell a story. Every couple is different but loving someone is the same. A session with us is filled with being yourselves and being comfortable. We also like to crack cheesy jokes, ask you to slow-mo run like you’re in an episode of Baywatch, give each other eskimo kisses and many lots of hugging and hand holding. 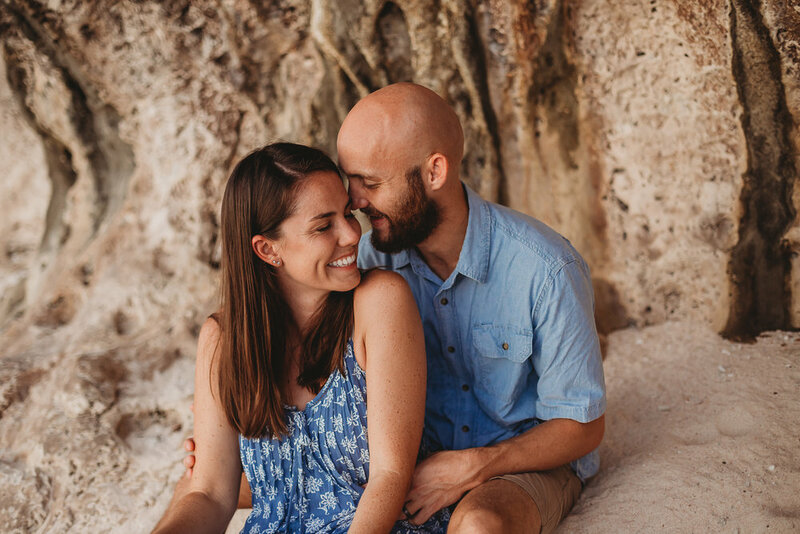 Our two goals at every sessions are: 1, make sure we are getting an authentic you as a couple and 2, when you look at your gallery you will feel love and happiness. Your engagement session is not only a session to announce ‘Ahhh!! We’re engaged! !’ but it’s a session to get you excited about your new adventures together as a couple, this is one of very few steps towards marriage and building a life together. A session with us is effortless. + When can we schedule an engagement session? Depending on what you do with your engagement photos will determine when is the ideal time frame to book. If you will use your photos for Save the Dates, we recommend doing your session 6-8 months prior to your wedding date. If you're going to print photos from (4x6s to banner size) to use as decor, we recommend 3-4 months prior to your wedding date. Just for fun? You can do them 2 months prior or even a month before and we've had couples do this after the wedding planning stress. On rare occasions, we have engagement sessions a week prior to a wedding. + We are so awkward!! How can we ensure we look our best? Leave it all up to us! We have shot numerous couples who have countless of times told us how "awkward" and "too silly to pose" they are and let me tell you, they produce the most gorgeous photos!! Trust us and we'll happily guide you to an awesome session that will have you laughing, kissing and running every 5 minutes! + Can we do a themed engagement session? Use props? We love themed engagement sessions! We've done a Disney's Up theme last year and last year we also did a very Black & Vogue styled session. We also welcome props but we prefer keeping them up to 3 items. Our sessions are focused on movement and emotion that all you need is to show up at the location! + What do we wear!? Wear anything you want! We always advice our couples to wear comfortable clothing and clothing they feel their best in. We also advice not to make outfits matchy-match. Choosing 1 or 2 colors to base your outfits on and build from there. For example, if your guy prefers wearing jeans, he can pair that with a long sleeve button up shirt and you can wear a long maxi dress (colors: he can be in the blue range (jeans are dark blue + top is light blue) and you can go with a patterned maxi dress (color: light pink or light yellow). We compiled a pinterest board for clothing over here! + How many locations do we go to? And if we can choose the location? You are only allowed 2 locations for your engagement session and that's if you choose our 'Perfect Engagement Session Package' that includes 2.5 hours and 2 locations. We can help you with the locations and/or you may also choose your locations. The only advice is to choose locations where the travel time between the locations are 15-20 minutes apart including traffic so we don't eat up time from your session. + How many photos are included? + Do you help pose us? Absolutely! Our job is to make you look and feel comfortable during the session. We'll make sure your body positions work in camera and you don't look awkward or stiff. We'll do the hard stuff, all you gotta do is breathe and relax! + What's the Guestbook? Is it just a blank book? The guestbook we offer is designed with the photos from your session and the layouts always vary with every guestbook we design. We design it from scratch using the images you have chosen from your gallery. There will be spaces in each page for your guest to sign at the wedding reception. It's killing two birds with one stone! They get to see your cute photos while leaving cute messages for you to read! + Is this also included in your wedding packages? + Do you need a deposit once we book? As of right now, we do not need a deposit for our portrait sessions. Once you pick your session date, location(s) and your package, we will pen you in our calendar. Retainers (non-refundable) are only required for our Wedding Packages. Your full payment is due on the day of your session. Every package is curated to ensure every type of couple is accommodated. Whether you’re shy, first timers in front of the camera or veterans in the art of selfies — these packages were created with every couple type in mind. just the start of the crazy, fun adventure of wedding planning! if you are ready to book, contact us below! Tell us how you envision your photos; do you think of a field? Cliff side? Urban look? By the ocean? How are you with public display of affection? Are you silly each other? Please let us know your ideal date and also follow it up with 2-3 other dates in case we're not available with your first choice.